It’s been a while since I posted one of these, and I can’t resist this cute little girl! Who is she? Bonus points for film name and other trivia associated with it! And thanks to Surjit Singh for the source! Posted on July 29, 2011 at 12:42 pm in Hindi movies, Trivia time	| RSS feed You can skip to the end and leave a reply. Baby Nargis in film TALASHE HAQ? I don’t blame you Harvey :D. I heard many unflattering comments about her looks. As she progressed in her career, she became more camera savvy – she could give some breath taking shots in profile. And of course her love for Raj gave her that ethereal look. I for one would have loved to see her and Raj (say from their ‘Aah’ days) in a frame by frame copy of Lean’s Brief Encounter. I would have replayed that disc forever! It is Nargis (although she was called Baby Rani not Baby Nargis) :) with Yakub! And it is the eyes that give her away, that’s about it! The film is Talashe Haq, and it was produced by her mother Jaddanbai. You mean the baby version of Nargis? wow! Yes, the baby version! She is so pretty, na? Wow. I thought her eyes looked familiar, but I couldn’t tell, really. How old was she when this was taken? Yes, she looks very different except those heavy-lidded eyes (which her son inherited too :)…she was about 5 or 6 when this was taken. Film was made in 1935, and she was born in 1929. Ka Boss :) I can’t put that kind of pressure on myself, Vikram! I would never be able to stick to a weekly trivia post. Lately I can’t even get a review up every week! :D Sanju inherited the best of both his parents’ looks. Yay, I figured it was Nargis much before I saw the comments section although I had no clue who the actor was! Her nose, eyes and lips made it easy to identify her. I didn’t know that she was a child star before! 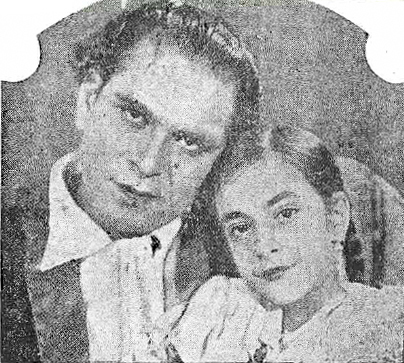 Nargis acted in her Mother Jaddanbai’s films when she was a child. She came back after that at the request of Mehboob Khan in his Taqdeer (1944). You may have seen him in ‘Paying Guest’ and the walk-on in ‘Kala Bazaar’ in the big star scene. Yaqub also had the leading role in Ab Dilli Door Nahin (1957) where he helps to take a kid to Delhi. The song ‘chhun chhun karti aayi chiDiyaa’ is picturized on him. And he was the sidekick to Dilip in Deedar. Oh! yess,,”chun chun karti aayi chidiya”…that guy yakub was just awsome..i’ve seen that movie also. This song is fav of my 5 yr old daughter.